By Ricki Shah, M.D., Howard O’Rourke, M.D. When tumoral calcinosis is suspected, key imaging features and its distribution allow for accurate diagnosis. Primary tumoral calcinosis often occurs in close proximity to large joints, bursae, and along the extensor tendons.2 Fluid-calcium levels are seen during the active phase, while solid, lobulated calcifications are seen in the inactive phase. 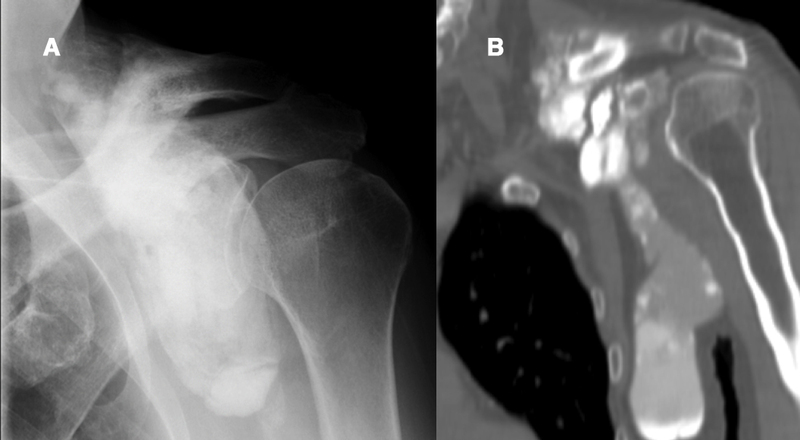 Similar imaging features and distribution patterns are seen with secondary tumoral calcinosis. The progressively expansile nature of tumoral calcinosis may lead to compression of adjacent structures, resulting in corresponding symptoms. Treatment includes surgical excision, although recurrence is somewhat common, particularly in infiltrative cases, as removal of the entire lesion may be difficult. Phosphate depletion therapy may also be beneficial. Ultimately, the differential for soft-tissue calcifications is extensive; however, recognizing the imaging findings of tumoral calcinosis can prevent unnecessary biopsy and allow for early treatment considerations. Olsen KM, Chew FS. Tumoral calcinosis: pearls, polemics, and alternative possibilities. Radiographics 2006;26(3):871-885. Steinbach LS, Johnston JO, Tepper EF, et al. Tumoral calcinosis: radiologic-pathologic correlation. Skeletal Radiol 1995;24(8):573-578. Shah R, O'Rourke H. At the Viewbox: Idiopathic Tumoral Calcinosis. J Am Osteopath Coll Radiol. 2016;5(4):26. Ricki Shah, M.D., Howard O’Rourke, M.D. Dr. Shah and Dr. O'Rourke are with the Division of Musculoskeletal Radiology, University of Iowa Hospitals & Clinics, Iowa City, IA.